With two small age gaps under my belt and a third on the horizon, double pushchairs have been a part of my life for three years. 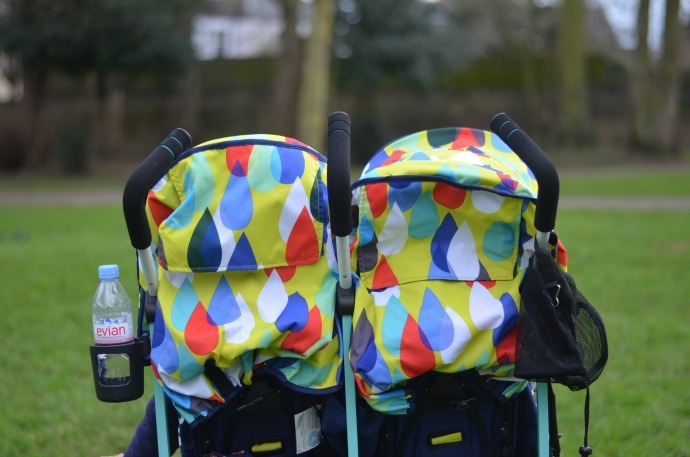 There seems to be more choice than ever and we were excited to try out the brand new To and Fro double from Cosatto. It boasts all the ease of an umbrella fold stroller but with the added advantage that when using it with a newborn, they can be parent facing. 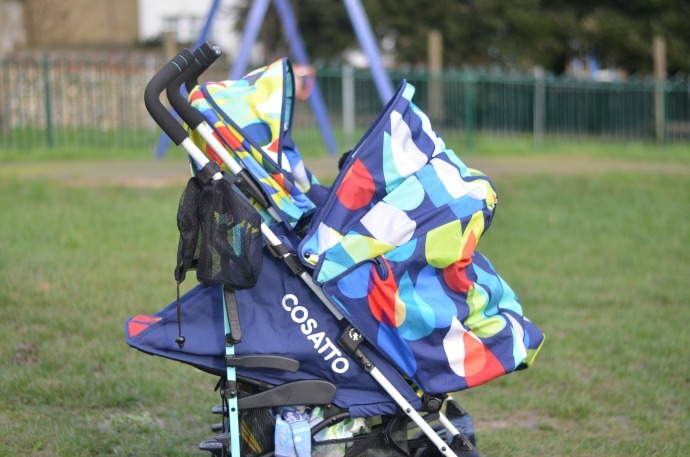 We love the extra features that Cosatto offer, and the to and fro double pushchair comes with a four year guarantee as standard. The design is bright and colourful (something I find very important), and I love how much this double stood out. The package comes complete with raincover, two footmuffs and cupholders and it is ready to go pretty much straight from the box. My favourite thing about the to and fro double stroller is the fact that the newborn can be parent facing. For me this is something I will not compromise, especially having had two winter newborns who needed the protection of being facing in. It is really easy to change from facing out to facing in and it lies completely flat with a five point harness. The hood is really generously sized and with the footmuff on as well it looks lovely and snuggly. I have used it for Finn facing in when he is tired, but in parent facing mode the child does have to be flat - I would love to see an option to have them parent facing sat up in the future. The seats seem quite a generous size for a side by side double, these pictures were taken just before Archie turned three and he is on the 75th centile for his height and weight. He isn't in a buggy much any more but his little legs still get tired on a long day out and it is important for me that he has a proper seat when he needs a rest. 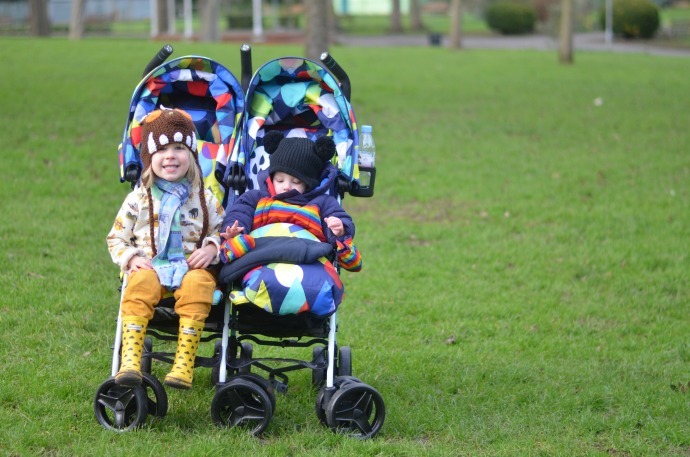 The pushchair comes with two footmuffs as I mentioned above, but I would say these are designed for twins more than siblings as they are suitable until around 12 months with an average sized baby. You can see in the picture the size of it compared to the size of Archie. 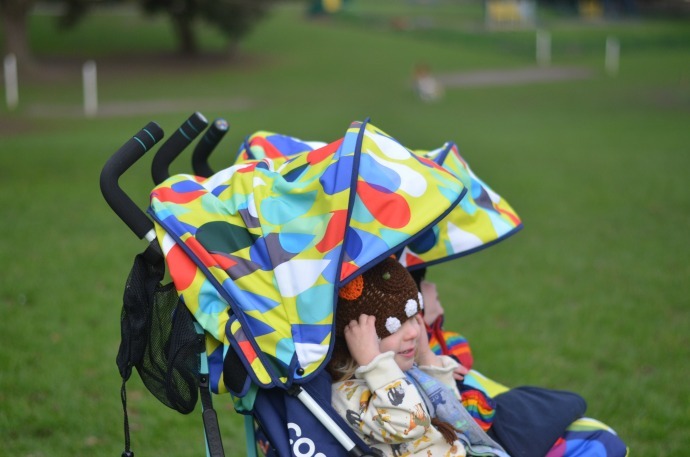 It would be great if you could order co-ordinated blankets for older siblings as I just love the raindrop design and it would be great to continue it across everything. The buggy was easy to push, I did need two hands but then the combined weight of these two is around 26kg so that isn't surprising! I found it easy enough to get up and down curbs, around corners and shops and I had no problem taking it on buses and trains. 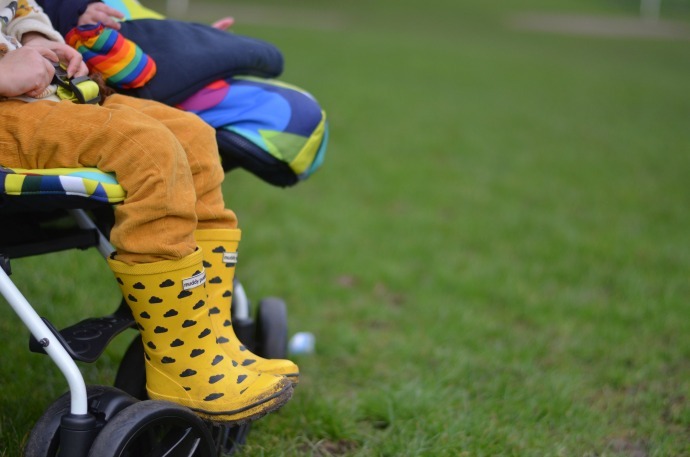 The baskets were pretty generous for a double buggy when the children are facing out although if they lie down or parent face then they are harder to access but not impossible at all. I am used to the fact that most double pushchairs sacrifice on basket space and this has the equivalent of two stroller baskets which is great. 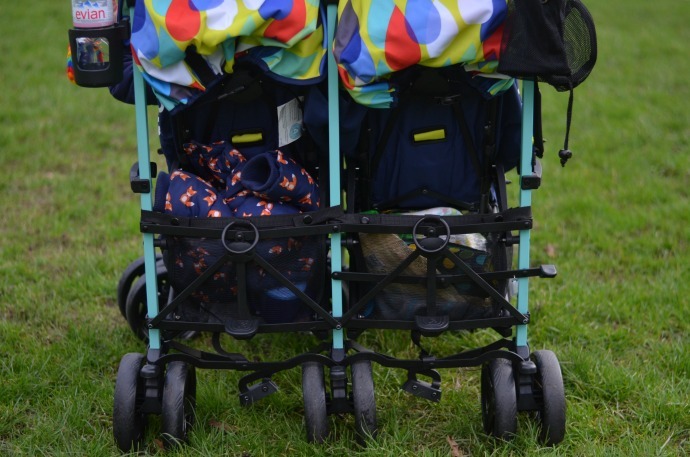 The buggy is compact when folded compared to other doubles, it has an umbrella fold similar to other strollers but of course is twice as wide. I did find that when folded the hoods came off completely so every time I set it up again I had to click them back on again. I do find it a bit annoying as I can't get the buggy in my house set up so we fold it up and down a lot but it only takes a minute or so each time. Overall, I would say that this is a good double stroller. 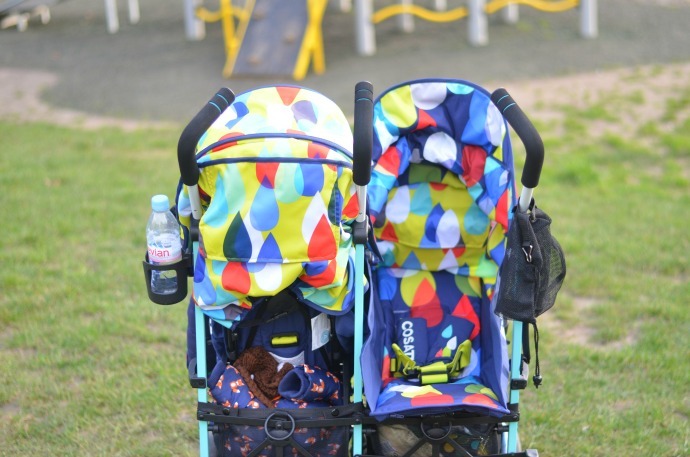 The fact that it can parent face for a newborn is something new and amazing and if I was looking to buy a double stroller to use from birth it would be this one without a doubt for that very reason. I would say that this is better suited for young twins than toddlers or children with a big age gap, but I find it easy enough to push despite quite a weight and size difference between my boys. Disclosure : I was sent this stroller for the purpose of this post but all thoughts and opinions are completely my own. Please could you tell me how wide the double pushchair is?